Hayyyy.. Christmas is fast approaching but typhoon is kept on coming here in the Philippines. Typhoon Mena is still in the Philippines and it was in the news this morning that typhoon Lando is in the Philippines again. Nahhh… bakit bumalik pa ang bagyong ito. But I am glad that this 2 typhoon will not hit Eastern Visayas. But there is another tropical storm that possibly hit Eastern Visayas. Sana naman lumabas na ang mga bagyo na ito sa ating bansa. Many of us are having difficulty in choosing what present we will give to our love ones. Since people now days is using digital camera and phone camera a gift that deal with this stuff will be nice. You don’t have to fret because I saw this site that offers digital picture frame and place a memorable photos of the person to which you are planning to give the present. I am definitely sure that the person who will receive this gift will be happy. Why not? She/he had the sweetest gift this Christmas. At digitalframez.com they offer 3 months warranty to their product that is broken due to faulty parts or manufacturing. You can also enjoy their crazy Christmas special which gives you 5% discount. They also offer digital frames and digital photo frames. They accept major credit cards and paypal. Hurry up place your order now so you can have the product before the holiday season ends. Christmas is in the air and whenever we think of Christmas it is also means that snow is visible to other country. A country like Philippines that don not have winter season a false snow that looks like a real snow will definitely make us happy especially the kids. They will for sure have a lot of fun playing under the instasnow that will make their holiday memorable. And our Christmas tree will be more attractive if I put some fake snow or at any Christmas décor we have at home. 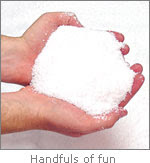 It is affordable and easy to use you just need to put some water and you will have a fake snow instantly. I saw this instasnow product that is safe and not toxic it only means that it is safe to the kids. You will only add some water and then you will have an instant snow for you to put in your Christmas tree or any Christmas decor that you wish. This will make your decor more elegance.